Equestrian properties in Charleston, SC can be very difficult to find. As one of the largest cities in South Carolina, Charleston is known more for its urban shopping areas and beach condos than its rural estates. However, if you have 6 months or so to keep an eye on the market and are willing to pay a fair price for the acreage, you can certainly find that perfect equestrian estate in Charleston. If you're looking to buy a horse farm as close to Charleston as possible, Johns Island is certainly your best bet. Although it's only 10 to 20 minutes from Downtown Charleston, this very large island is known for its horse pastures and agricultural farms in addition to the neighborhoods sprinkled throughout. Rural West Ashley and Wadmalaw Island are also good options to consider. You might find an occasional property in rural Summerville or Goose Creek, but these are generally few and far between. Buyers looking for more affordable options with less upkeep often choose to live in one of Charleston's three neighborhoods with equestrian amenities. For example, in the town of Hollywood (part of Rural West Ashley), the communities Stono Ferry and Poplar Grove feature equestrian facilities. 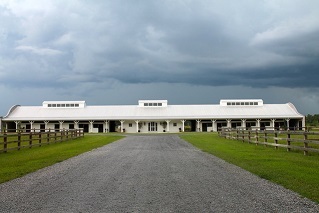 Poplar Grove's facilities are some of the nicest you'll find in the Low Country, and they offer over 50 miles of trails; a 300 by 400 foot arena; 8 paddocks; large pastures; 22 stalls for boarding horses; a stable with restrooms, showers, and dressing rooms for owners; and a washing station and laundry room for your horse. (You'll see the Poplar Grove stable pictured to the left and above.) Home buyers tend to be very impressed with this 6,000 acre community. 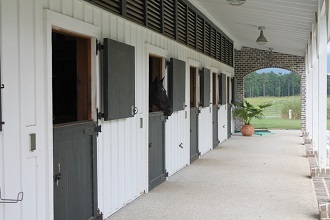 The Stono Ferry equestrian center offers 22 stables in addition to instruction courses and summer camps. It also hosts competitions such as the Charleston Cup steeplechase race. 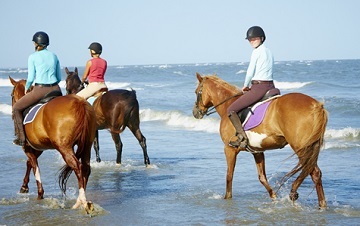 Seabrook Island also offers an equestrian center for residents and non-residents to enjoy. You'll find 42 stalls, well maintained pastures, and 3 miles of trails. In fact, this is one of only a few beaches on the East Coast that allows horses on its beachfront (pictured), creating a very unique riding experience. Seabrook also offers riding lessons and guided trail rides. 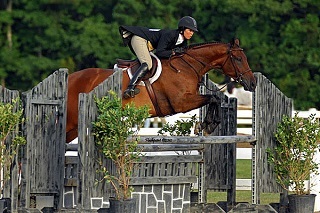 Of the Charleston equestrian communities, Seabrook is the largest. This barrier island offers a resort style beach setting with full amenities including two championship golf courses, professional tennis facilities, a full service marina with shops and a restaurant, regular summer camps for the kids, nature tours, and inshore and offshore fishing. Because full equestrian estates and communities tend to be expensive, it's important to consider other (more affordable) options as well if you don't find what you're looking for. For example, you can buy a nice home in a Johns Island neighborhood in the $180K plus range and board your horse at a nearby stable. Johns Island is also home to the Mullet Hall Equestrian Center, which is a great public facility owned by the Charleston County Park system and offers trail riding, horse shows, and competitions (no boarding, but a really fantastic equine center to live near). Ready to consider your options? Whether you're looking for a quaint horse farm, a full equestrian estate, or a home within a horse-friendly community, we're happy to send you the options currently available on the Charleston MLS and work with you to find that perfect property! Contact us to get started!